UNIVERSAL RIGHT ANGLE IRONS by Suburban Tool, Inc. Useful for clamping work in multiple positions. 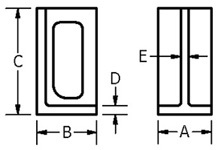 Machined finish - Square and parallel within 0.002" per 6". Ground finish - Square within 0.0005" per 6". Parallel within 0.00025" per 6".